Who says pasta has to be Italian? 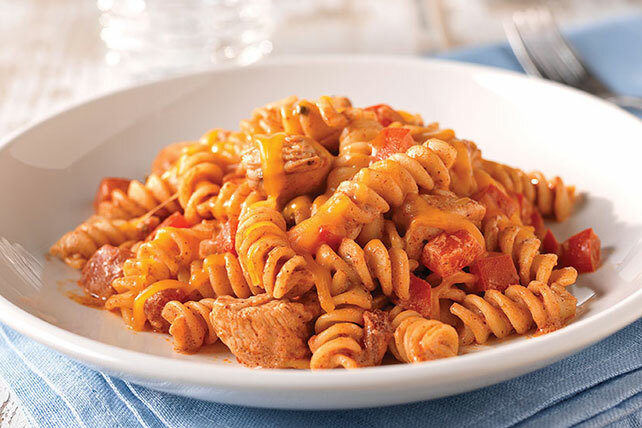 This Fiesta Chicken Pasta will have your family asking for seconds—en español! Meanwhile, heat oil in large skillet on medium-high heat. Add chicken. Cook and stir 6 min. Add peppers, dressing and chili powder; cook 3 min. or until chicken is done, stirring frequently. Stir in salsa and sour cream. Drain pasta. Toss with chicken mixture. Sprinkle with cheese. Substitute lean ground beef for the chicken. Omit oil. Brown meat and drain before adding peppers. Chili powder is a powdered seasoning mix that is available in the spice aisle of your grocery store. Despite the name, it's not hot and spicy, but it does add a nice touch of Tex-Mex flavor.